The waterpik Wp-660 is being advertised as The Best Waterpik on the market. But before we even entertain this notion we need to look at it in critical detail and see whether it stands up to this statement. Waterpiks are getting more popular by the day because of the apparent superiority they have over regular flossing. There have also been studies carried out highlighting this point in more detail. Essentially the pressure of the water that is released from the tube disrupts the small particles and soft plaque from in between teeth and this keeps bacteria from settling down and forming biofilms. Can regular flossing get the job done? To be honest if your brushing and normal flossing is good then buying a waterpik is not an ideal investment but if your someone who has trouble using string floss and make your gums bleed as a result then it is worth looking into! 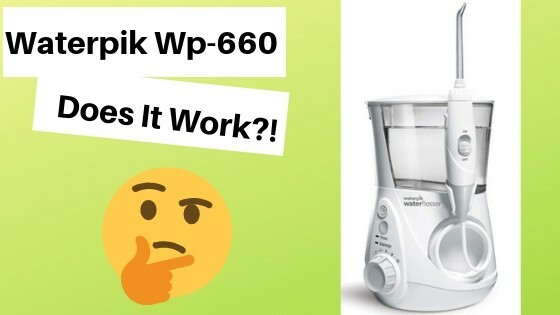 What Is The Waterpik Wp-660? It’s an electrically driven device that pumps water at high pressure in between your gums and teeth. It has a small tank to hold the water and different settings so you can choose the one that suits you best. It’s been approved by the American Dental Association and as such has the seal of acceptance marked on it. It’s relatively big so has to be set on a counter top close to a mains connection for it to work. It could be quite hazardous with all the water around so you will need to be extra careful while using it. It’s also undergone clinical trials which has resulted in significant improvements in oral health, including a 93% improvement in reducing bleeding and up to 52% better at reducing gingivitis than traditional dental floss. It’s currently the Number 1 seller as well as being Amazons choice and with over 13000 reviews there must be something right about it. Why not go and read what previous customers have been saying about it. One of the reason you should invest in the waterpik 660 is the…. This option allows you to control how much pressure the machine releases at a given moment, its’s especially useful if you have sensitive teeth because then you can adjust it to suit your gums so it wont be painful to use. Thats why so many people love it, Everyone can use it! You as the buyer are getting alot of value with this feature because it allows you to floss your teeth according to the specific problem you have at any given time. Pick your colour now over at Amazon while stocks last! This model can be used by people who don’t know how to floss effectively using regular string floss or people who suffer from gum disease. It’s been studied and has the potential to combat this problem if used as part of a good oral routine. The only age range we would caution is children under 8 years old because the pressure from the nozzle might be too much for some and it could cause pain to the gums and make them sensitive. In saying that, the pressure can be adjusted to a level where it doesn’t cause discomfort but we reckon the more powerful settings will give the best results with this kind of flossing. Fill the water tank/reservoir with lukewarm water (tank can be lifted out and replaced). Fit the appropriate nozzle to the handle of the flosser ensuring it has clipped into place. Adjust the pressure dial on the unit to your desired pressure level (can be adjusted later). If it’s your first time using, turn down to a lower setting. Press the power button to switch the unit on. Lean over the sink and place the tip of the flosser into your mouth. Close the lips enough to prevent splashing while still allowing water to flow from mouth into the sink. Slide the switch on the handle from off to on, the water will begin to flow. Aim water at the gum line at a 90 degree angle. Follow the gum line and pause briefly between teeth. When complete, slide the button to ‘off’ and then press the power button to turn it off. Dont leave water in the basin, or put any non-liquid or sticky additives in. You dont want things clogging up the tubing. On/Off button hard to switch. There have been some reviews by customers stating that the on/off button on the handle is hard to operate, however you also need keep in mind that these same people also have reported to have arthritis in their fingers. generally these people would have difficulty operating all similar oral irrigation devices not just the wp 660. Size. Its a little bulky, not ideal for the smallest bathrooms with limited work surface space. Messy. It can take some time to get used to the right technique and avoid making a mess but initially you are bound to get water squirting all around you. With over 13000 reviews on Amazon and currently holding the Number 1 Seller status as well Amazons choice you should feel confident about it. It has an average of 4.4 stars out of 5 which means the majority of people liked it. The general consensus was it did a great job at removing plaque and food debris from in between teeth and was quite easy to use after getting familiar with it. They also like the fact they got so many different extra in terms of tip heads which meant they could share it with family members. The only downside is the noise it makes. Sure it’s bearable but make sure you don’t use it whilst you have people sleeping otherwise they won’t be very happy with you! Currently the waterpik 660 is available on Amazon which is great because of their high level of customer service and a 30 day return policy they offer if the product is malfunctioning. There’s nothing to lose. It’s currently priced at $69.99 down from $89.99 which gives you a saving of $20.00 but we are not sure how long this offer will stay up. Amazon likes to play around with pricing options, it may go up or it may go down but if you like you have read then we recommend you Go and check out the Wp-660 and take advantage of the special offer. Final verdict: Is The Waterpik WP 660 Worth It? Effectively removes plaque from in between your teeth..
Clinically and scientifically tested by the American Dental Association..
Because if you just sit there and let dirt and grime get into your teeth, you will be in alot more pain as you get older! Q. Is the Waterpik 660 available in Europe? Q. Where to buy this particular model? A. You can purchase the waterpik wp 660 directly from Amazon. Q. Waterpik offers a 3 year warranty on this product, If i purchase through Amazon, is the warranty still valid? Q. Can this be used with mouthwash in the reservoir? A. We don’t see why not. Pure mouthwash might be too much for the mouth coming out at hard force and would also use quite a lot. We know someone who mixes half and half. Since some mouthwashes can be sticky, we would also run clear water through to clear the hose. If you have anymore lingering questions about this water flosser then please get in touch and we will be more than happy to help out. I have actually been looking into purchasing a water pik because I have issues with trying to floss in the very back where my wisdom teeth once were. This is the best review, of any water pik, that I have came across. You have made my decision a lot easier. Are there any other attachments that I can purchase to go with this one? Hi dawn, thanks for the comment. Yeah i mean i find it quite hard to floss with regular strips. Like you i cant get to the back of my teeth and especially because my teeth aren’t aligned properly so it makes it extra awkward. 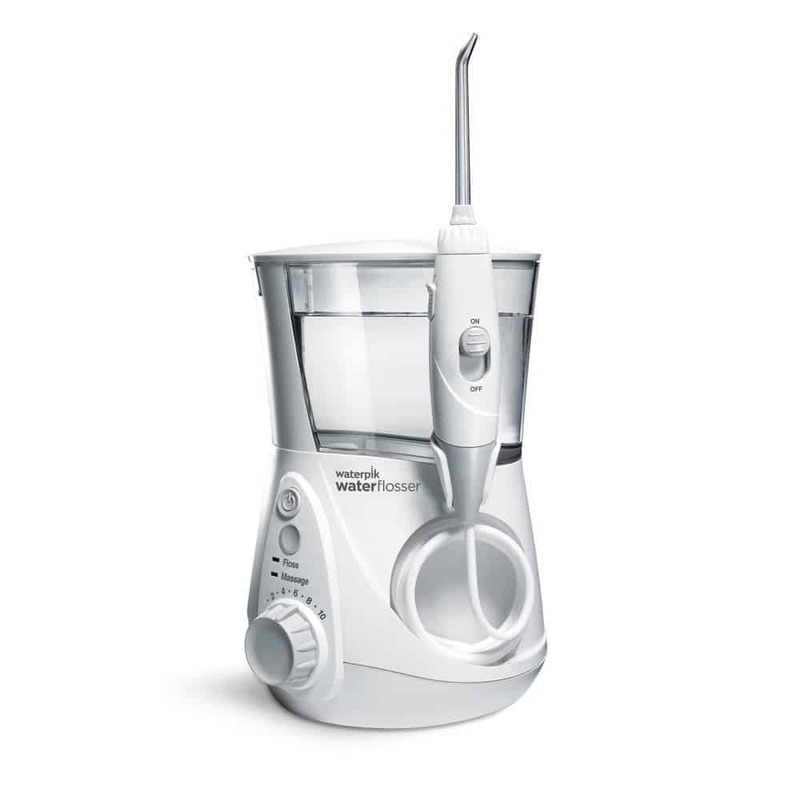 The waterpik is really good because for me it makes it alot easier to floss. 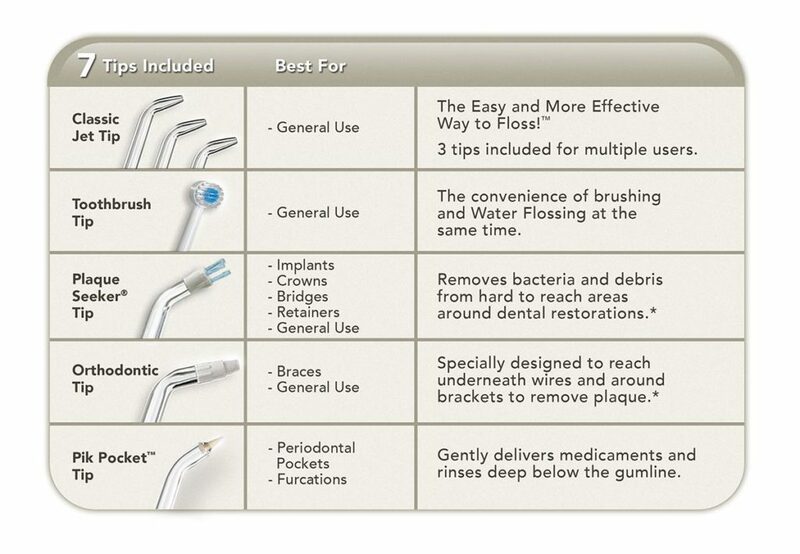 Coming to your question, the flosser comes with 7 attachments each carrying out an individual function. In my opinion that is all you need to keep your teeth nice and clean. I mean if one of the attachment breaks you can order a replacement. 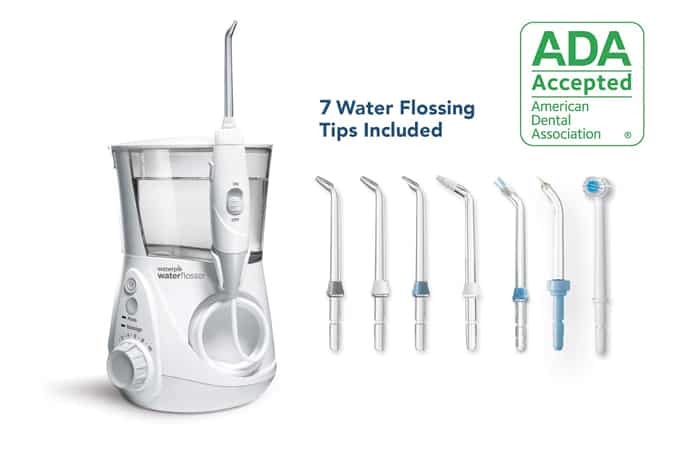 Would you say this water flosser is more effective than regular flossing, or using a floss harp? I do this everyday about 2 times and I feel like my teeth and gums are healthy, I don’t usually get a lot of trouble at dentist. But if you think this product is then I might give it so consideration. My mum bought something similar to it and seems to like it. Although when I tired it, it was a little uncomfortable. Do you know the product your mum uses exactly? This is amazing. I really loves how this waterpik works. I have never heard of this before, but reading this post has made me realised how cool this is. This waterpik is cool but what really scares me is the part that said it could be hazardious with all water around me. How can someone avoid the danger at 100% rate? I don’t think there is any bathroom where the socket is directly next to the sink. This means you are safe as no water will be in contact with the socket and therefore no risk of electric shock. Though this is my very first time of coming across the waterpik WPv660device. Its incredible to know that it pumps water at high pressure in between the gum and the teeth. Sometimes am amazed when i see the extent to which technological inventions are being borne daily. Also its ten different pressure setting makes the device a very flexible one. Thanks so much for this write up, it has really been helpful. Thanks for taking the time to write this review on Waterpik Wp-660.Waterpik indeed is a nice product. That is exactly why the American Dental Association recommended it. The features of Waterpik makes it stand out among its competitors. The truth is not everyone would like a product, but with the over 13,000 review with 4.4 rating, it is clear the equipment does it work well. Waterpik is an upgrade on regular flossing. Above it, with the 3 years warranty on the product, disgruntled customer can always return it. I recommend the product. Hi, I really like this flossing system since its really hard for me to floss the back of my teeth and specially my retainer. Does this come in a smaller version? 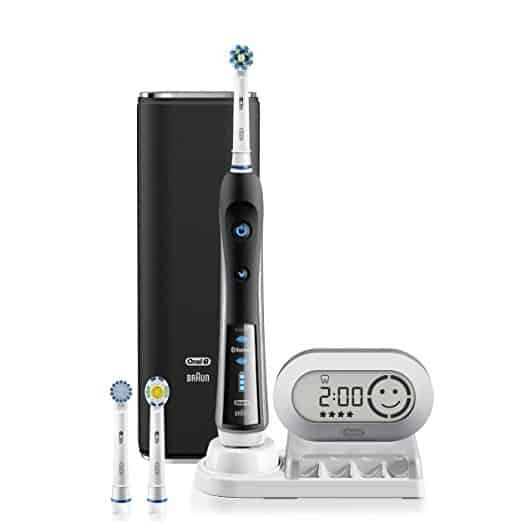 I have an electronic tooth brush but this one seems better since it comes with a flossing system. 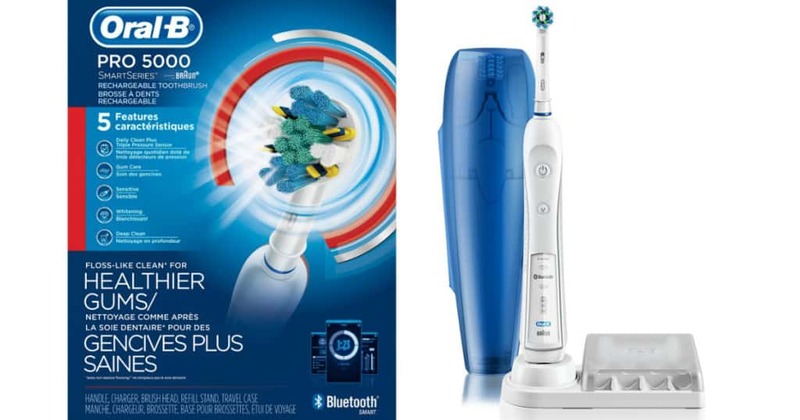 Also I noticed it only brings one round tooth brush, can they be bought separately? I enjoyed the article but found it a bit too long. Unfortunately the waterpik does not come in a smaller version, although you could opt to go for the portable water flossers which are smaller. Yes you can buy separate brush heads for the waterpik. Great article about Waterpik WP660 and an awesome writeup too. I really got to know all I needed to know about the product. You did a good work in analysing how it is better than regular flossing jet in case of bleeding gums. You article is very impressive. Keep up the good work. Will definitely bookmark and share for my friends. Thanks for sharing this review on waterpik WP 660. Lately I have been searching online to get a waterpik, I am glad that I stumbled upon your site today. Keeping the teeth in good condition and healthy is what everyone should do. I don’t wanna get old and start having pains in my teeth. I will have to order my own waterpik tomorrow. Thanks for sharing this article.